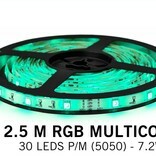 2,5 meter 12V RGB LED strip with 30 LEDs per meter. Ideal for decorative color accents. The high luminance A-Grade LEDs are of type 5050 and can emit RGB full color. The transparent splashproof protection (IP65) makes the strip very versatile. For a beautiful finished result and better light distribution, you can insert the LED strip in an aluminum profile. This RGB LED strip profile here. The power consumption is only 7 watts per meter but still outputs up to 500 lumens per meter! 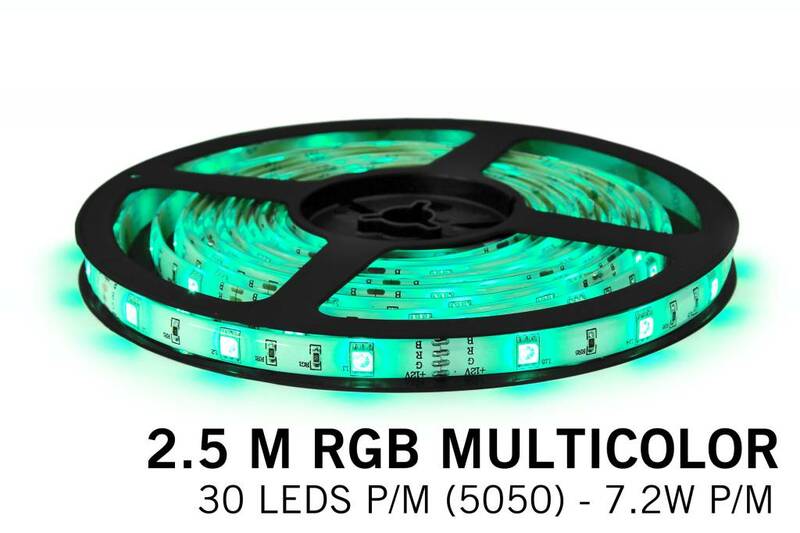 The LED strip with 30 LEDs per meter (total 75 LEDs) has a length of 2,5 meters and has a 4-pin RGB connectors on one side. Use an RGB LED strip controller and a power supply of 12 volts to power up this strip.